Are you eating something right now? If so, stop eating it and turn it around and look at the nutritional label on the back of the product. Does it say "High Fructose Corn Syrup" on the back? You may have just noticed it and are now thinking to yourself "WTF is this?!?!?!". HFCs are literally syrups from corn that have undergone processing to convert themselves into a sweetener used in commercial products. If the light bulb went off in your head and you are saying "ahh sugar! ", turn the light bulb off, it is not sugar!!! 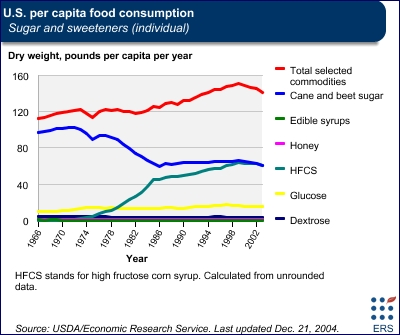 So what is the problem with HFCs? 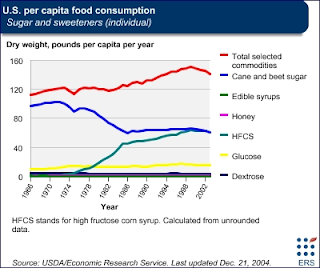 Well first off all, in lab tests, rodents that consumed HFCs gained more weight than rodents given just 10% sucrose with the same caloric content. Now, another light bulb should be going off in your head, haven't obesity rates been drastically increasing in western civilization over the last 20 years? While it is very much speculation, it does lead one to wonder whether there is correlation between the two figures. An additional group of rodents were tested, this time being allowed to eat as much as they wanted (of an HFC based product) but being restricted to a sedentary lifestyle, which would emulate that of many Americans. Within just four weeks, the animals showed signs of Type-II Diabetes and and fatty liver disease. An obviously disturbing discovery. So should you throw out all you products containing HFCs out the window? Probably not, but it is always good to be mindful of exactly what you are eating and how it can effect your body. My recommendation would be to seek out all natural products that use cane sugar or other naturally occurring sweeteners. While many sugars are not good for you at all, perhaps those with a naturally occurring makeup, may be better for you in the long run.